The Walking Dead isn’t your typical zombie apocalypse. It’s a survival horror with more emphasis on survival, and that isn’t necessarily a bad thing! As a fan of the original Walking Dead novels and the TV show, it goes without saying that I was excited to hear that a videogame was being released. However the game does not follow the same characters, but is set in the same setting. The story of Walking Dead: A new day follows Lee Everett, a former history teacher who was en-route to prison when the police car he was travelling with hit a walker and toppled off the highway. Lee then meets Clementine. A small girl who he finds hiding in a tree house alone after her babysitter had become undead. Lee and Clementine then meet other survivors and their fight for their own survival begins. Even though the story follows different people there are appearances from characters that are in the original story, such as Hershel Greene. I think that the inclusion of the new characters and their struggle is excellent as you get to see the zombie apocalypse from a different perspective. The story took me about 2 hours to play through, however this was only episode 1 and there are set to be 5 episodes coming out within the near future. If you go into the Walking Dead thinking it’ll be anything like other zombie apocalypse games you’ll be disappointed. This game doesn’t follow the usual “run around shooting zombies for hours” formula that its rivals do and I think that’s one of its strengths. 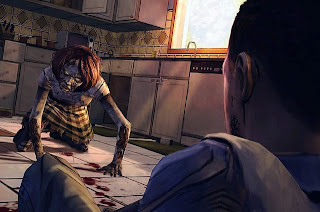 In the graphic novel the story is not about fighting the zombies, it’s about surviving and the gameplay reflects this. The game is more of an interactive cutscene with exploration parts added in. There are times when you’ll find yourself mashing the B button frantically to escape the clutches of a Walker. However, there are also times where you’ll be exploring a house looking for certain objects that you require in order to survive or help other survivors. Moments such as helping a fellow survivor escape imminent death with a few quick button pushes stand out from the rest of the gameplay and the style in which these moments are scripted are really well done and convey the sense of urgency in the situation. The Walking Dead’s visual are suited perfectly to the background of the story. This is because as most fans of the series know, it was initially a graphic novel before it was adapted into a TV show. The comic book style which is used in the game is perfect for conveying emotion on character's faces. When a survivor is eaten alive in front of the group you can really see the horror in each of their faces. The environments of the Walking Dead also follow the comic book style and are aesthetically pleasing as well as surprisingly detailed in some areas. 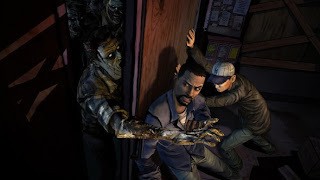 The sound used within the Walking Dead is perfect for the zombie apocalypse that is unfolding with explosions, shuffling zombies and of course, the selection of gory sounds really gives the game a tense atmosphere. The voice acting is also good, although in some places leaves a little to be desired as some characters come across a little unconvincing. The Walking Dead: A new day is a fresh take on the Walking Dead franchise and an even fresher take on the zombie game genre. The characters and their fight for survival really bring you to the edge of your seat and the intuitive controls make surviving the apocalypse a challenge, but also great fun.